West Riding of Yorkshire: Cawthorne (2), West Clayton, Denby, Gonthwaite, High Hoyland, Hoyland Swaine, Hunshelf, Ingbirchworth, Kexborough, Langsett, Oxspring, Penistone, Silkstone, Thurgoland, Thurlstone. The population falling within the union at the 1841 census had been 12,803 with parishes ranging in size from Gonthwaite (population 66) to Thurlstone (1,872). The Guardians had their first meeting on 20th October, 1849. For its first ten years, the new union operated without a workhouse. 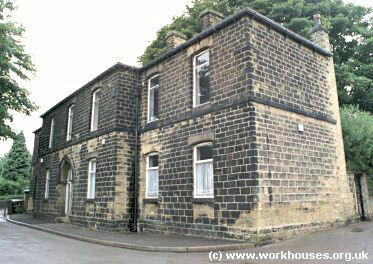 Then in 1859 a new workhouse was built on a sloping site at the west side of Huddersfield Road to the north of Penistone. The architects were Henry F Lockwood and William Mawson who also designed workhouses at Barnsley, Bradford, Dewsbury and North Bierley. The Penistone workhouse location and layout are shown on the 1893 map below. The porter's lodge, board room, master's office, bed-sitting rooms for the resident porter and clerk, and a receiving ward were located in a building at the north-west of the site. Penistone receiving block from the east, 2001. The main building had a cruciform layout with an octagonal hub, similar to the radial designs popular in the 1830s, but with short wings. Males were accommodated at the west, and females at the east, with the Master's quarters at the centre. The rear wing contained the dining room and kitchen. Day rooms and laundry block was located behind. Penistone main block with laundry block behind from the south-east, 2001. Penistone main block from the west, 2001. An infirmary, designed by GA Wilde, was erected at the north-east of the workhouse in 1895. Penistone infirmary block from the south, 2001. An isolation hospital stood at the east of the site and a small mortuary at the north. Along the roadside at the west was a vagrants' block containing 18 cells and a sulphur candle disinfector to fumigate the inmates' clothes. A piggery was situated to its south. Much of the workhouse grounds were cultivated as a kitchen garden to grow food for use in the workhouse. In 1871, the workhouse accommodated 95 inmates including 41 males and 29 females aged over sixteen, 17 boys and 8 girls. At the 1881 census, there were 97 in residence plus 14 vagrants and 5 staff — Master and Matron, porter, school teacher and nurse..
During the First World War, the workhouse was used to accommodate wounded soldiers while were convalescing. In 1928, the workhouse suffered an outbreak of smallpox, thought to have been carried to the workhouse by vagrants from Barnsley. There were a total of 8 cases, one of which proved fatal. Patients were treated at the Penistone District Smallpox Hospital erected a few years earlier but previously unused. In 1930, the workhouse was taken over by the West Riding County Council Welfare Authority and continued in operation as a Public Assistance Institution. An initial report at the time of the take-over drew attention "to the home-like atmosphere that pervades this Institution and to the excellent manner in which the Institution is arranged and maintained so as to ensure the maximum comfort of the inmates." Many of the buildings were, however, in a bad state of repair. The casual block by this date had been disused for many years. In 1948, the Institution became Netherfield Aged Persons Home. The inmates became "residents" with the main block housing males, and the old infirmary block housing females. All existing infirmary patients were transferred to NHS hospitals. In 1974, the residents were transferred to purpose-built homes and the site was taken over by the local education authority. The former workhouse buildings are now used as the sixth-form college of Penistone Grammar School. Sheffield Archives, 52 Shoreham Street, Sheffield S1 4SP. Virtually no local records survive.